One reason Windward chose to settle here was because this location gets a serious bout of winter each year - more snow than most cityfolk are willing to deal with. The happy result is a lower level of development and a greater degree of self-reliance on the part of the people who do choose to live year round in this neck of the woods. We get two months of weather that I would describe as uncomfortably hot, and two that are uncomfortably cold - which leaves eight months that are just right. During the long days of July and August, we retreat to our quarters during the heat of the afternoon and marvel at how well evaporative coolers work in this dry climate, or perhaps grab a book and head for a hammock in the trees to relax until the heat of the day passes, or head down to the Klickitat to dangle our feet in the cool water running down from the Mount Adams snowpack. The other two awkward months are January and February - the days are short, things freeze up and eventually the snow brings outside activities to a halt. Which is fine, especially so now that we've got a notably enhanced range of options to work with. Early on in our stay on this land, we were pretty much holed up once snow came - now we've got the dining hall with it's marvelous wood stove, housing that's rigged to keep the water running inspite of the cold, and work spaces such that we can use the time to catch up on maintenance - and for an operations like this, there's always maintenance that needs doing. 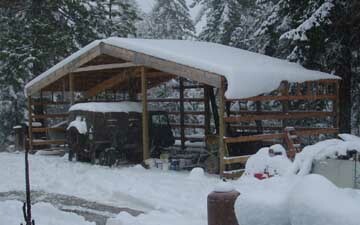 This winter we have a wealth of new winter-ready resources such as the Pinz, the Dump, the wood shed and the wood shop. And while the wood shop isn't ready to do any wood working (sort of needs walls and a floor), it is a handy area in which to work on equipment. 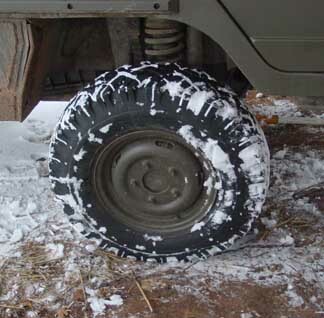 One thing that makes the Pinz so handy in deep snow is it's unually high ground clearance. 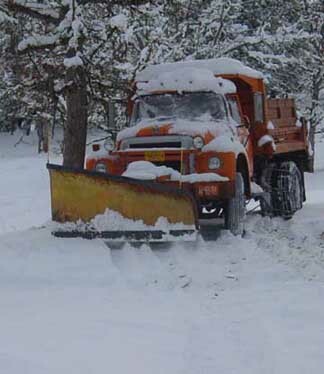 While it tires aren't much taller than those on the 3/4 ton pickup, it's undercarriage has much greater clearance - it just passes over snow that would trapped the pickup's axles. The Pinz also has individually lockable differentials - which means that even if two opposite wheels are free spinning, a condition which will trap other 4WDs, the Pinz can lock the differentials and power on ahead. That's not a configuration which will allow you to do fancy things, like turn, but once you're moving you can unlock the front differential and regain steering. The only real problem with the Pinz was that by being so high off the ground, it was hard to climb up into the cab, a problem that got worse when you were all bundled up for the cold. Looking at the skirt under the door, it wasn't clear that there was a good way to mount a step to help short people climb in. In this case, I'm defining "short" as anyone under six feet tall. I'm 5'10" and it's a strain for me to get up and in the cab under normal conditions; when I'm wearing snow gear, it's awkward indeed. 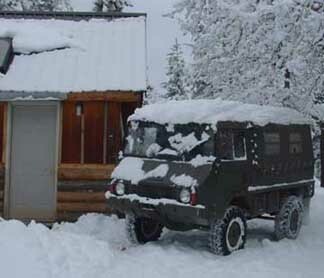 This vehicle was designed as a snow jeep for the Swiss army, so I'm presuming that ease-of-entry wasn't their first consideration when they spec'd the vehicle. And it's handling in the snow more than makes up for it; it has a turning radius in the snow that's thighter than any other vehicle on site, with the possible exception of the orchard tractor. One of the marvelous things of our age is the internet, a source for all kinds of information so long as you can figure out where to look and who to ask. Soon after we got the Pinz, I signed up for an email list for Pinz people, and that led me to a website in Phoenix that featured specialty items for this odd breed of winter jeep. The answer they'd come up with involved installing a pipe-like fitting between the wheel rim and the brake housing. The fitting had a flange that had been machined to exactly fit into a recess on the brake drum. And so, the answer in hand, it was just a matter of placing and order and waiting for deliver. Unfortunately, by the time the parts arrived, we were in deep snow. No problem - just drive the Pinz into the center bay of the wood shop, and to work we go. The first step was to track down the floor jack; when there's more than a foot of snow on the ground, it can be tricky to remember right where you left some tool, and more than once we've had to wait until spring to find something. We often refer to something as being in "deep storage" meaning that we know that it's on site somewhere, we just don't know where that somewhere is. And in winter, deep storage can get quite deep indeed. 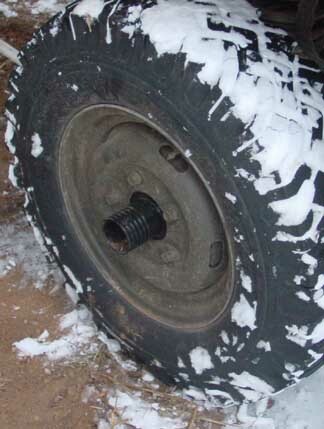 With clear, frozen ground to work on it was not a big deal to jack up the Pinz, pull the wheels, insert the wheel steps and tighten down the wheel again. I'm pleased to report that the wheel steps work just fine and make getting into the rig no problem at all. Even for us short people. Now, I'm not saying that it was fun to kneel on the frozen ground inside the wood shop and do the work, but it sure was a whole lot better than having to kneel down in the snow and then search for the lug nut that inevitably gets away.